Deer stalking is classed as a rural sport but for most people who participate in it, it has more to do with protecting their crops and forests. Deers produce a lot of young, and can easily create huge amounts of damage if their numbers aren't kept in check. Why is Deer Stalking Carried Out? Deer stalking is often carried out by those whose land is affected by deer, and it is seen as a way of limiting both the deer population and the damage that they create. Old and weak deer are first in line, but young female deer may also be in the firing line if a lot of new deer have been born that year. Young males are known to damage forests, and can then be targeted as a result. However, it's not as straight forward as this, as you need to carefully balance the number of deer that are killed to make sure that the remaining deer aren't at risk of starving. Responsible deer stalkers should have a good understanding of the legal aspects, especially regarding shooting locations. The Country Code should be adhered to throughout. If your knowledge isn't quite up to scratch, you can take a recognised training course or achieve the Deer Stalking Certificate. Both of these are optional, but they will help you to become a better deer stalker. Deer stalkers use guns that are more than capable of killing, even from a long way off. Because of this, you need to take care when shooting. Preferably, take out third party liability insurance beforehand, along with responsible weapon handling insurance. Shooting ranges should make sure that any shot that is fired results in a direct kill. For this reason, don't shoot a deer while it's on the run, when light and visibility is limited, and when there is any form of cover in the middle. Make sure that the gun that you're using is legal for the type of deer that you're targeting. In England and Wales, all deer must be shot with a minimum calibre of .240 inches and a minimum muzzle energy of 1700 foot pounds. In Northern Ireland, the minimum calibre is .236 inches and the minimum bullet weight is 100 grains. In Scotland, all deer must be shot with a bullet that weighs at least 100 grains. The minimum energy is 1750 foot pounds. 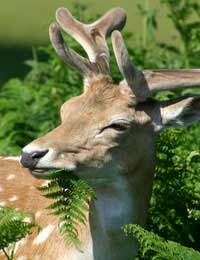 For roe deer in Scotland, the minimum bullet weight is 50 grains, and the minimum muzzle energy is 1000 foot pounds. All of these refer to the bare minimum in legal terms. Make sure that your rifle has been test-fired (safely, of course). If it takes any knocks, it should be corrected to maintain the correct aim. This should also be done after any shots that are completely off-target. As well as your rifle and ammunition, you'll also need binoculars to make sure that you accurately identify the type of deer, a torch (if deer staking after dark) and a knife that is appropriate for the job in hand. Deer stalking is an effective way of controlling the deer population if they're causing considerable damage to local crops and forests. Shooting them is a skill though, as the intention is to kill, not wound.